Oh no, this one ended up being much longer than I planned. And I still don’t think I’ve said everything that needs to be said about this book. Usually, when you pick up a memoir, you expect that the author and their life will be the main focus of the book. But this doesn’t always have to be the case; a few months ago, I reviewed Rick Morton’s 100 Years of Dirt, which bent this mould out of shape a bit by including the author’s perspective on the class divide in Australia; and to be honest, I thought it was a better book becasue of it. Danger Music is another sort of ‘broad’ memoir that, while not quite in the same vein as 100 Years of Dirt; still covers more than just the author’s personal struggles, and goes out of it’s way to examine the society around them. And that society is modern-day Kabul. When I realised I was transgender, it was a life-destroying moment: I knew from then on that I would never be happy until I did something about it. But to do something about it meant possibly losing everything. It turned out that I lost everything because I didn’t do anything about it. He privately nursed this realisation for close to fifteen years, telling very few people, and certainly not coming out. But by 2014, he reached some kind of breaking point – he had sunk into depression and quit his job in radio. In his own words, he had hit a dead end. So how then did he end up in Afghanistan? 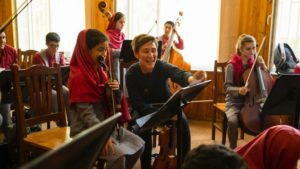 Eddie had previously visited in 2013, where he had spent two weeks getting to know the young students of the Afghanistan National Institute of Music (ANIM), which he seems to have found a highly enjoyable experience. Not long after he had resigned from his radio job, Eddie learnt from the news that a bomb had gone off at a performance at the Cultural Centre in Kabul, killing several and injuring the director of ANIM, Afghani-Australian Dr Sarmast. 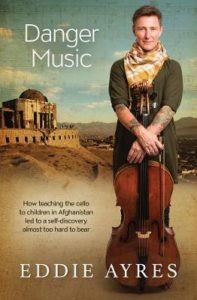 This spurred Eddie to write to the recovering Dr Sarmast, asking if he could apply for the position of cello teacher at his school. Because apparently, living in a near war zone was more enticing than living with what he had in his head at this time. At this point, I was sitting there with the book going ‘Well, crap!’ While I understand the idea of finding a new purpose to help get your life on track or moving overseas to get away from it all; I was still boggled by the idea that someone dealing with the fact that they were transgender would just get up and leave for Afghanistan. Even without the Taliban in power, Afghanistan is a place with some very strict gender roles! But Eddie goes ahead with it, regardless. Now, this is where I have to share some of my naiveté: while I was aware in general how very repressive the Taliban regime was, I had no idea they were so opposed to music. Music! Apparently, this opposition is derived from a commonly ignored Hadith. I was also clueless as to the importance of music to Afghani life. Once the Taliban captured Kabul in the mid-’90s, they went on the cultural offensive. Musicians were jailed, and instruments were destroyed. Even owning recordings on cassette and VHS tapes were forbidden. This was an extraordinary act of cultural vandalism, and to illustrate the point, Eddie compares it to banning Australians from watching and playing sport. It’s incredible the level of damage this did to their society, and I’m tempted to read up on this further, as it seems just too unreal. So if anyone was wondering why someone would send a sixteen-year-old suicide bomber to target a musical performance in the centre of Kabul, you now know why. It also illustrates why the vision of ANIM and Dr Sarmast is so essential. ANIM’s goal is to teach both traditional Western and Afghani music to their young students. The inclusion of Western-style music likely helps maintain funding, while teaching traditional music helps in reviving and maintain cultural practices that others tried so hard to stamp out. In this way, you can see the establishment of the school as a form of soft resistance. Another way ANIM pushes back against the more repressive parts of the society is that it is open to both girls as well as boys. This takes us to the second focus of the book – the students of the ANIM and their life in Kabul. While the Taliban have been ousted from power, Kabul is still an unstable place to live, and violence is commonplace. The students of ANIM have more than just practising their scales to worry about. It’s common for students to hide the fact they are going to school from disapproving members of their extended family. A talented viola player may shirk away from participating in a public performance, incase someone in her family sees the broadcast. Another may stop practising at home because their father considers the school to be a waste of time. All too often, children are suddenly pulled from school because they are being married off. One charismatic young guitarist, who didn’t leave and perhaps should have, killed a man one weekend and continued to attend class as if nothing happened. Other children leave because their families see a chance to migrate, and act with little notice in case the window of opportunity shuts completely. Eddie uses the phrase ‘minds of children, hearts of ancients’ to describe the heightened state of stress these children live under, and the childhoods of these young people are much harsher than anyone deserves. Eddie teching the students at ANIM. One fo the drawbacks of reading this on an ereader is that the book’s photos don’t look as good as they would in the print version. Unfortunately, the instability of Kabul life ends up getting to almost everyone. It’s not just the students and their families that make the choice to leave, but many of the teachers, both local and foreign, start to move on as well. With Eddie, one of the factors that came into play was his choice to complete medical transition. We’re also given the impression that the stress brought on by another particularly bad incident with a student also took its toll. This book is an emotional rollercoaster, to the point it has taken me a few months to get around to writing this review. It’s such an easy read, but that in itself is deceptive – there’s just so much to process here. It bends my mind at times to think of what I would do or how I might react if I lived in the same situations as the teachers and students of this school. Thankfully for me, Eddie leaves a small follow up chapter at the end of the book, detailing how the lives of many of the people form Kabul have progressed since he left, which helped assuage the anxiety I felt for some of the students a little. He also has a playlist of music at the end as well, which I thought was rather sweet. As for Eddie himself? He’s back in Australia, and he’s back on radio; so hopefully he’s doig well. This book hadn’t come up on my radar, but you make a compelling case for it. Thanks for sharing!